Teen Wolf returned in all of its cheesy glory tonight in “Creatures of the Night.” In the episode, Scott, Lydia, Kira, Stiles, Mila and Liam reunited at school for an old senior tradition while a storm raged around them, and unbeknownst to them, a new foe was on the hunt for Scott. “Creatures of the Night” passed the Bechdel and race test but did not pass the Russo test. Lydia is a prisoner at Eichen House. There were three occasions where women talked to each other in “Creatures of the Night” (when Kira talked to her parents and Kira and Lydia talked to each other), and on one of those occasions named women talked only to each other and did not mention men (e.g., Kira asked Lydia if signing her [Kira’s] name on a library bookshelf was vandalism) so the episode passed the Bechdel test. “Creatures of the Night” also passed the race test, and the episode passed this test because there were three different instances where non-White characters talked to each other without mentioning White people. For example, Kira talked to her parents on two different occasions about school and an old fable, and Scott asked Kira whether or not she had had fun in New York. 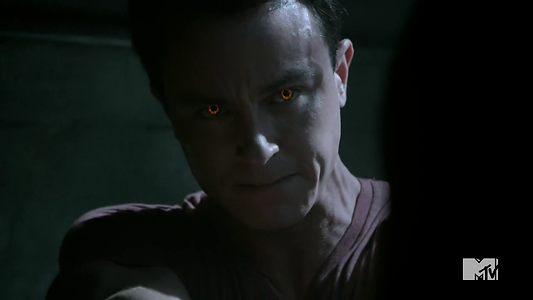 Parrish runs into some trouble. When it comes to the Russo test, “Creatures of the Night” did not pass this test, and the episode did not pass this test because there were no LGBTI characters in the episode. Posted in American, TV and tagged Bechdel, MTV, Race Test, Teen Wolf, TV, Vito Russo. Bookmark the permalink.